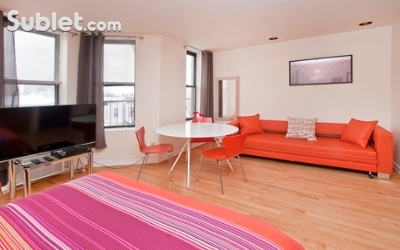 Completely furnished, adorable studio available short-term or long-term. The place is bright and sunny with hard wood floors, large kitchen and plenty of storage. I provide dishes, pots, pans, and also bedding and towels if you need them. There is a queen bed also a small pullout sofa. The apartment is located in a safe area popular with Manhattan prof_essionals. Excellent location - just 20 minutes by bus to Times Square. Buses stop two blocks away and run non stop (every 5 minutes during rush hour, and a bit less frequently all night long). Also, the light rail that connects to the Hoboken and Jersey City Path train stops down the block. The light rail also connects to the ferry that services Midtown and Downtown Manhattan in 7 minutes. Plenty of shopping, restaurants, shops, groceries... Supermarket, dry-cleaners, drug-store, grocery on the same block. No car is needed to live here, but if you do have a car, street parking is available.